"All paths are the same: they lead nowhere. They are paths going through the bush, or into the bush. In my own life I could say I have traversed long long paths, but I am not anywhere. Does this path have a heart? If it does, the path is good; if it doesn't, it is of no use. Both paths lead nowhere; but one has a heart, the other doesn't. One makes for a joyful journey; as long as you follow it, you are one with it. The other will make you curse your life. One makes you strong; the other weakens you." I thought about this while hiking this section. On the PCT hikers are often asked where are you going. Usually we answer "To Canada," but really that is only the briefest of stops. Maybe it would be better to say towards calm, gratitude, and equanimity. Or different hiker might be headed towards mischief, fun, and romance. 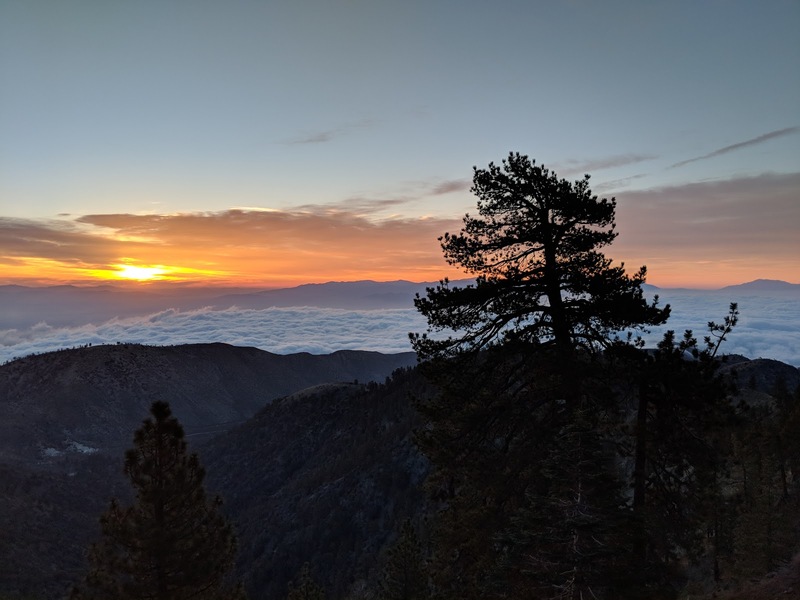 This section began with a 27 mile sub-section with access to Wrightwood. I tackled the first 20 miles on the first day with 7,000+ ft of climbing, leaving me knackered as I set up my tent at 8,000 ft. The reward was a fabulous sunrise the next day, with clouds stretched out below the campsite. The next day I did the last 7 miles to highway 2, hitched into Wrightwood and picked up my resupply box. A few other hikers were having breakfast at a local cafe, so I enjoyed a hamburger while marvelling at the enormous breakfasts being downed by Doc, 15-foot, and David Overturf. It only took a few minutes to catch an afternoon hitch back to the trail, and I just went on a few miles before pitching in a pine forest. The next day I got an early start and summited Mt. Baden Powell before continuing on. By the afternoon a heavy fog enveloped the mountain, and the temperature dropped. Rain was forecast for the next day, so most hikers made an effort to get as far down the trail as possible, with only limited success, forcing us all to pitch in heavy fog. The next morning I packed a wet tent and dug deep to get as far as the Mill Creek Fire Station in a 26 mile day. My reward, included getting blasted by grapple on the trail and a rainy night camped below the fire station. The following day promised relief 21 miles down the trail, but the first 17 miles were in intermittent fog, and a howling wind at the unfortunately-placed North Fork Ranger Station. Finally the trail wound to the lee side of the mountain range and dropped 1,000 ft into a canyon. I pitched in late afternoon sun and slept soundly that night. The last day was a relatively short 14 mile hike into Agua Dulce, where the Saufley's host "Hiker Heaven," which lives up to it's name with showers, laundry, and lounging areas. I will take a zero day there tomorrow.